If you've ever had the good luck to spend some time near running water, you can attest to the calming properties first hand. Sleeping next to an ocean, a stream, a river, or waterfall can induce a special kind of tranquility and calm often not experienced elsewhere. This is no doubt why we are commonly called for backyard waterfalls. The common man can have access to a luxurious, peaceful home - without paying top dollar for a waterfront property. 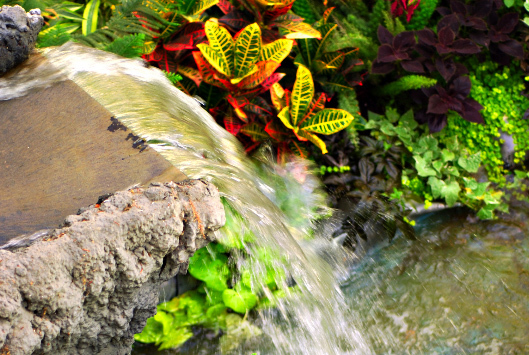 A backyard waterfall is a relatively simple project - when done by the experts, and is not all that expensive to create. The two major components of a backyard waterfall is the water pool itself, and the cascading feature off which the water will run. Both are important features, and should have a cohesive theme to keep the water feature tied together appropriately. Most people choose to use unique configurations of stones and rocks to create the cascading feature, then use the same or similar stones to create a border around the pool feature. A simple pump in the pool and some hosing directed towards the top of the cascading feature will keep the same water circulating through the feature. While the job itself is relatively simple, there are quite a few considerations in the creation of the waterfall. We can lend you the experienced knowledge to help you determine size, shape, style, location, and the details of your backyard waterfall. With your consultation, we'll get the exact materials needed for the job, and can oftentimes complete the job start to finish in one afternoon, leaving you free to entertain your friends and family in front of your beautiful new waterfall by that evening!